Adelaide Airport Limited (AAL) has received an application relating to the change of use of an existing facility used for a ‘warehouse/office’ to a ‘light industry/office’ for Aerobond Pty Ltd on airport land. A preliminary assessment of the application has deemed the proposal as a Merit Use development. 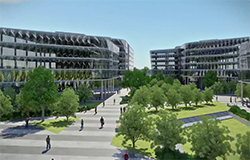 The proposed site is located at Unit E, 5 Butler Boulevard in the Burbridge Business Park, identified in the Master Plan as the Terminals and Business Precinct. Make a decision on the Use activity.